President of Sotheby's Beijing is thrilled as Spring Auction of Modern and Contemporary Chinese Art sale ends over it's high estimate at USD 18,7 million. Modern and Contemporary Chinese Art proves to be highly coveted. Zao Wou-Ki (Zhao Wuji) 1920-2013 SOUS BOIS DANS LA NUIT, oil on canvas 91.8 by 72.9 cm. 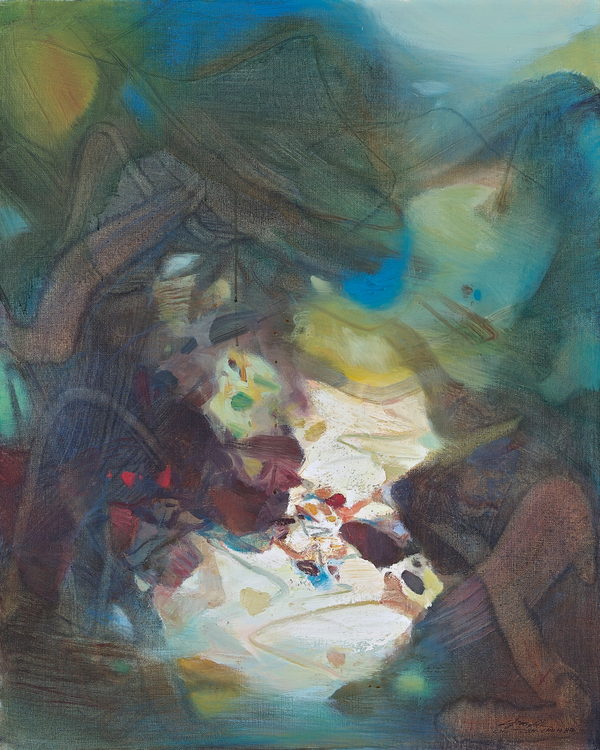 ; 36 1/8 by 28 3/4 in.“We are thrilled with the results of Sotheby’s Beijing 2014 Spring Sale, which had been carefully curated by the company’s unrivalled global network and attracted collectors and art lovers from across China and beyond. I am proud that the company continues to serve the art community within China by providing world-class collecting and educational opportunities.” Wen Guihua, President of Sotheby’s in Beijing concluded as Sotheby’s Spring Auction of Modern and Contemporary Chinese Art sale came to an end on June 1st. With 44 works and 85% of lots sold at USD 18,625,695, well over it’s estimate of 13,7 million, the sale was a success confirming the healthy growth of Beijing’s art-market. Chu Teh-Chun (Zhu Dequn) 1920-2014 RENCONTRE, 1984, oil on canvas, 80.8 by 65 cm. ; 31 ⅞ by 25 ⅝ in. Six bidders competed for Zao Wou-Ki’s Sous bois dans la nuit before it was, followed by a small eruption of applause, sold to a bidder in the room as the sale’s highest fetching lot for USD 5,833,979. High prices were achieved for iconic Modern works by Chu Teh-Chun and Wang Yidong, as well as for the Contemporary Chinese artists Liu Xiaodong, Zhao Bandi, Zhou Chunya and Mao Yan. Liu Xiaodong B. 1963 FAMILY PARTY oil on canvas, 200 by 200 cm. ; 78 ¾ by 78 ¾ in. Liu Xiaodong B. 1963 FAMILY PARTY oil on canvas, 200 by 200 cm. ; 78 ¾ by 78 ¾ in.The sale was the grand finale of the auction houses three-day series including the Selling Exhibition 2014, showcasing modern and contemporary Chinese and Western Arts and an exhibition of Chinese realist painting from the Hui Tong Collection with supporting gallery walks and lectures. For Chinese Modern and Contemporary Art on Barnebys click here.